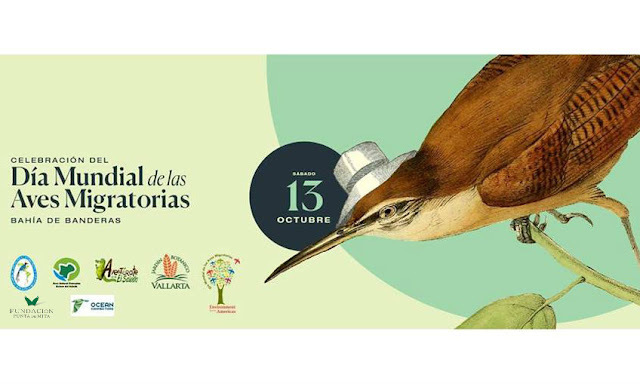 “World Migratory Bird Day” will be celebrated for the first time next October 13th with the slogan “Uniting our voices for bird conservation. The celebrations will be hosted in all three of Bahía de Banderas’ municipalities: the Higuera Blanca public plaza in the Riviera Nayarit, the El Salado Estuary, and the Puerto Vallarta Botanical Gardens. The event in Higuera Blanca will begin at 8 a.m. with a birdwatching and environmental interpretation trek (occupancy is limited, please pre-register). It will be followed by activities and educational talks given by organizers and local eco-tourism service providers between 10:30 a.m. and 2 p.m. Right after there will be a screening of the movie The Big Year (2011, USA) from 2 p.m. to 4 p.m. Once that ends, the award ceremony for the Children’s Poetry and Drawing Contest will be held from 4 p.m. to 5 p.m.
For more details and to register for the treks email: birdingsanpancho@gmail.com or call 322 139 7242 or 322 154 8108.